(l to r) Rosemarie DeWitt stars as Alice and Matt Damon stars as Steve in Gus Van Sant’s contemporary drama “Promised Land.” ©Focus Features. CR: Scott Green. Aside from the bald pate, though, there remains the handsome features of a man that People magazine once dubbed The Sexiest Man Alive. The 42-year-old Cambridge, Mass. native is much more than a pretty face. He’s also an Academy Award winning screenwriter for “Good Will Hunting,” which he famously co-wrote with fellow longtime friend Ben Affleck. He’s also an accomplished actor and producer, a notable humanitarian and political activist and, most importantly, a dedicated husband and father of four. Damon was hoping to add feature filmmaker to his vast resume with the thought-provoking story he wrote that tackles the tough issues surrounding our energy crisis in “Promised Land,” but bowed out when he realized he wasn’t quite ready for the demanding job. 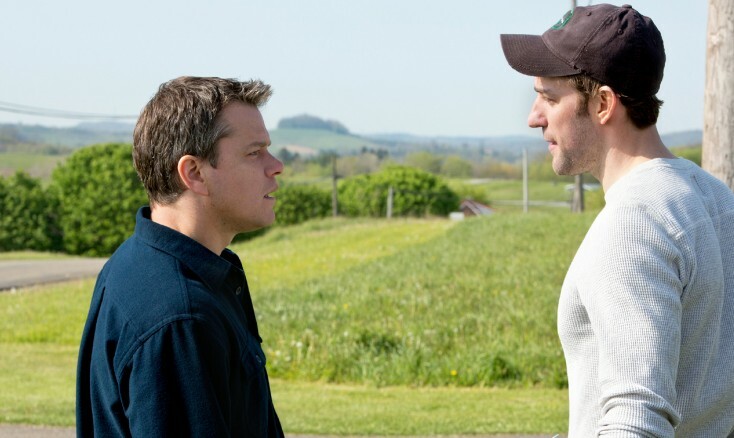 Instead, he recruited his “Good Will Hunting” director Gus Van Sant to helm the small town drama, in which Damon co-stars with “The Office’s” John Krasinski, who co-wrote the script with him. The actor plays successful energy company representative Steve Butler who arrives at a rural Pennsylvania town to convince the locals to sell natural gas drilling rights on their land to his company. His folksy I’m-one-of-you approach and charming manner make his job very easy. But things become a bit more challenging when an outspoken high school science teacher (Hal Holbrook) and another recent arrival (played by Krasinski), who identifies himself as an environmentalist, start warning the residents about the downside of selling out—namely that their groundwater may become contaminated and their crops will die. The two outsiders vie for support from the townspeople, who decide to take it to a vote whether they will welcome fracking (as it’s called) or not. Damon and Krasinski don’t offer an easy solution but merely present the subject in hopes of opening a dialogue about it. Q: What attracted you to this story? Why did you want to want to write it? And how did you and John Krasinski become writing partners? Damon: What we really wanted to write about was America right now, like, where we are today. We were talking about American identity, and where we’ve come from and where we are and where we’re headed. And we knew that we wanted to have a hopeful ending. We wanted it to be a pro-community, pro-democracy type of movie. John had kicked around some ideas with (author) Dave Eggers. They’d come up with the idea of these salesmen coming to a town. Then Dave had to go write a book, which he does often, and so John brought this to me. We agreed to sit down and write it and see what happens. Q: With your busy schedules, how did you find the time? Damon: He was doing (“The Office”) and I was (filming) “We Bought a Zoo.” So on Saturdays, he would show up at my house for breakfast, and then we’d write all day. Then we’d do it again on Sunday. Q: I heard you guys watched “The Little Mermaid” together because your kids were around. Damon: (He laughs.) He could sing you every song as a lot of parents of little girls can. During the week, we’d revise the script, and then we’d get together the next weekend and do it again. Within a couple weeks it was clear we were really making progress and it was good. Q: Your film seems to address the issue of hydrofracturing in a balanced way, without being too preachy. How were you able to achieve that balance and not offer a tidy solution? Damon: We just didn’t want to have an answer because it wasn’t about that. My character says, “This is your decision” to the residents. That’s why we didn’t show the outcome of the vote. Q: Did you know a lot about fracking beforehand or did you have to do a lot of research on the subject? Damon: We did a lot of research. I’d seen stories on it but hadn’t really been paying close attention to it. I would hear it occasionally or go online. I’d see articles about it, but I wouldn’t read them. With four young kids, I just wasn’t engaged with it really at all. When it became a potential backdrop for our movie is when we really started looking at it. The more we looked at it, the more we went “Wow, this is actually perfect because people are so divided.” The issues are so complex. It is a temporary lifeline to some people but there are potential horrific outcomes downstream. If you believe the energy industry, there are potential downstream benefits that we can’t even imagine and geopolitical benefits. It’s such a high stakes game that it seemed like a perfect place to set a movie. It’s about the decisions we make as communities and taking responsibility for them, and to show the kind of the human side of all this stuff without making it a polemic. Q: Did you have any objections from the locals while filming in Pennsylvania? Damon: Yeah. The first day we were filming, some farmers showed up and said, “Is this a movie about fracking?” meaning we shouldn’t say anything bad about it. There were people from the other side showing up saying, “Don’t say anything good about it. It’s terrible. It’s (creating) climate change and ruining our water. People are getting sick so don’t show a good side of this.” We really ultimately want the movie to start a conversation. It’s not up to us to give anybody the answer. Damon: My life is different from 15 years ago, but my love of (acting) hasn’t changed at all. I just know more. (He laughs.) I have more experience than I had 15 years ago. I appreciated Gus more this time because he is one of those great directors who is deceptively quiet. He appears very relaxed and calm. If you didn’t know what you were looking at, you wouldn’t think he was doing very much, but, in fact, he is doing quite a bit. With this film, I was in a better position to see just how he was doing it. Also, because I originally was going to direct it, I was able to see a lot of the things that he did that I was going to do and then some things that he did that I hadn’t thought of that were just strokes of genius. Q: How are your decisions about choosing roles different now from when you were starting out? Damon: On the work side, I feel as giddy now as I was then to go to work with Gus. I feel unbelievably lucky to work with people like him and (Steven) Soderbergh and Clint (Eastwood) and Paul Greengrass over and over again. I’ve become even more convinced that it’s a director’s medium, and the most important person on a film is the director. I used to think the script and the role were most important. I still look at the role and think about if I have something to bring to it, but most importantly for me, it’s really about working with a director. Q: Was it tough when you realized that you wouldn’t have time to direct this yourself? Damon: Yeah. It was really tough but the joke that John and I had was that my greatest contribution as a producer was firing myself as a director. (He chuckles.) It’s probably true because we got Gus. I couldn’t, for scheduling reasons, do it. I would have been away too long from my family. That would have distracted me and I wouldn’t have done a good job. Q: Does that mean you have to wait until all your kids are in school before you direct a film? Damon: I could take them (on location). We could go on an adventure together somewhere. Originally, this was supposed to be shot in New York. But then as we started really looking at (logistics) and realized we were going to have to either go upstate or to Pennsylvania. So I would have been 12 weeks away (from home) in pre-production, plus six or seven weeks shooting. That was too much time. Q: Speaking of your family, your wife, Luciana, is from Argentina. Do your children speak Spanish? Damon: Yeah. My 2-year-old is bilingual. My 4-year-old is not. We’ve been reading about how to do (teach bilingualism) but, so far, we’ve been hit or miss. Now, we’re rigorous with our 2-year-old. Damon: A little bit. I keep dreaming that (Spanish director) Pedro Almodovar or (Mexican director Alejandro Gonzalez) Inarritu will give me a job so I can go to a Spanish-speaking country and we can bring the kids. My wife, Lucy, is truly bilingual. The kids hear a lot of Spanish around the house. Q: So are you through with Jason Bourne? Damon: No. I want to do another one. We just can’t figure out the story. We were very close to making one a few years ago and then we just couldn’t crack the story. The studio had made a deal with the (Robert Ludlum) estate and they had to get a Jason Bourne movie out for 2012. Damon: When we couldn’t figure out a how to get a Jason Bourne movie out, (screenwriter) Tony (Gilroy) came up with a way to do one with Jeremy, so that’s what they did. But I talk to Paul (Greengrass) about it occasionally, and it’s really just a question of how do you bring the character back. Is there a movie that’s as good as the other three that we did? We just haven’t cracked it yet. Q: Career-wise, are you motivated by fear or desire? Damon: Desire. It’s the kids that literally get me out of bed. Q: Do you ever fear losing it all? Damon: No. Look at what happened to Ben (Affleck). He got put in actor jail for a while (after “Gigli”). We always felt like we could write our way out of that. We came from nowhere (as actors) but if you can write, then you can write yourself a part. That’s what Ben did. He did it once with “Good Will Hunting” and then he did it again (with “Gone Baby Gone”). That gives me hope that no matter what happens, there’s always (screenwriting) to fall back on. Q: Will you collaborate again with Ben?